A 15-year-old girl was in critical condition in hospital on Monday after being hit by a car. A five-year-old boy was also struck and suffered a number of fractures to his collar bone, ankle and foot. 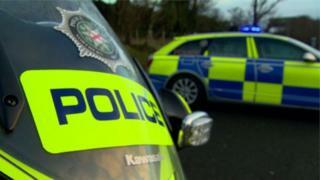 The incident involving a red Suzuki Swift happened at about 17.30 BST on Monday in the Belfast Road area of Antrim. Police are appealing for anyone with dashcam footage of the road taken around that time to come forward. "The 15 year old girl is currently being treated in hospital where her condition is described as critical," PSNI Insp Claire Gilbert said. "A five year old boy, who sustained a number of fractures to his collar bone, ankle and foot is also receiving treatment in hospital." Meanwhile, the Doogary Road in Omagh, County Tyrone, was closed on Monday evening in both directions following what police described as a "serious" two vehicle crash. The Northern Ireland Ambulance Service (NIAS) said it received a 999 call at about 14:44 BST. One rapid response paramedic and two emergency ambulance crews were sent to the scene.